Emanuel Miller has been the most efficient player for Team Canada’s U18 team at FIBA Americas, along side Andrew Nembhard. The 6’7 forward has been the X-Factor for Canada in wins against Argentina and Ecuador. More than 4,000 people attended the game against Ecuador, including over 30 NCAA coaches and NBA scouts. Miller is currently being recruited the hardest by Oklahoma, which was his first offer and Ohio State. Oklahoma’s Coach Carlin Hartman has gotten more familiar with the Canadian landscape, having recruited the country during his time at Columbia, Rice and now Oklahoma. Ohio State was a finalist with Miller’s teammate and producer Andrew Nembhard. With one more year on the prep level and all these schools in attendance, the interest for a role player like Miller is bubbling. The best player comparison for Miller is Draymond Green, from a stylistic standpoint. Ok, Green minus the trash talking. When it comes to likability from coaches and teammates, energy and defensive presence, that all checks off. At U18 FIBA Americas he finishes against Argentina with 18 points and 6 rebounds and against Ecuador with 19 points, 8 rebounds and 4 assists. Miller praised his teammates for being able to produce the way that he has. Canada will take on Chile in their final game of pool play tomorrow at 8:15pmEST. Miller, AJ Lawson, Andrew Nembhard and Addison Patterson have been terrific thus far for team Canada. We`ll see how far they can carry this Canadian team on home soil. Top Canadian Prospects at St Mike’s Tournament – Draw released! 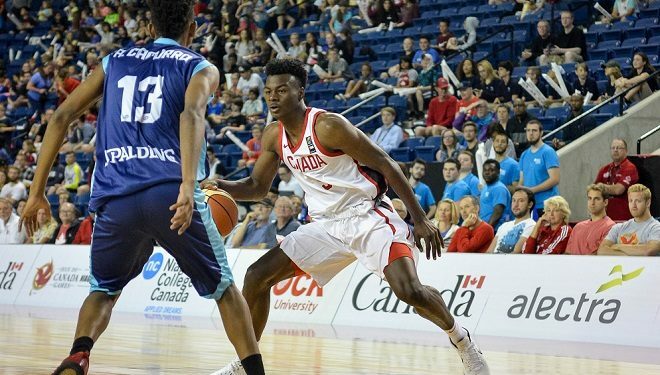 Canada 0-4 at Tuto Marchand Cup Entering FIBA Americas…Time to Panic?